What is even rarer than a Swedish science fiction movie? A Swedish disaster movie. Den blomstertid nu kommer suggests what happens if Swedish infrastructure and society are attacked by a hostile force. The film title actually refers to a Swedish summertime hymn, traditionally credited to Israel Kolmodin, a Lutheran priest. The origin of the hymn is debated, but it is old; it was first published in the 1695 Swedish Hymnal, to a tune known to have existed since 1693. In Sweden and Finland the hymn is traditionally sung at the end of the school year, before the summer holidays, and as such it has reached widespread recognition in both Finnish and Swedish culture. It is strongly associated with summer, but the Swedish disaster movie of the same title is far from a cosy pastel summer fantasy. The original titles means “Now the time of blossoming arrives” with The unthinkable being the international title, which perhaps gives a better idea of what happens in the dystopian thriller. The 2h9m film proposes a mysterious attack against Sweden. It is midsummer and war alarms are set off. Phone lines, TV and the internet are down, helicopters explode in the sky, and a series of violent attacks take place around the country. Set in a post-apocalyptic near future, Alex (Christoffer Nordenrot) returns to his home town to patch up with his estranged father. He also tries to reunite with his youth love, Anna (Lisa Henni), during their attempt to save themselves and survive until a new Sweden emerges. The unthinkable has been created by a group of Swedish filmmakers known as Crazy Pictures, whose experience lies in music videos, commercials and short films. Victor Danell is credited as the director, although the group works in a “collective” way, with Danell also co-writing the movie with actor Nordenrot. The film, which is the group’s first feature, has been in development since 2015 when a Kickstarter fundraiser was started, based on an idea from 2011. The goal was 300.000 SEK but when the funding period ended after 32 days, 2285 backers had pledged more than 788.000 SEK (around 80.000 euros), which was more than enough to start the project. The final budget reached 1.9 million euros, with funds coming from public financing bodies such as the local Norrköping Film Fund and the regional backer Film i Väst. The film was shot in 2016 and 2017 and includes a high number of effects shots, around 450, which is unusual for a Swedish film. 25 special and visual effects artists were employed to create the impression of a much more expensive movie, but emphasis was also put on practical effects and stunts. One of the executive producers is John Nordling, who also produced Let the right one in and the remake, Let me in. In a comment, Crazy Pictures producer Olle Tholén, said: -The ambition has always been to create a spectacular and uncompromising Swedish film that we would like to see in the cinema ourselves. MovieZine: “Something new has exploded in the bleak Swedish film sphere. Hollywood is going to knock on the door soon, but I hope Crazy Pictures have the guts and the resources to continue making exciting projects at home. They are needed here.” Their rating is 4 of 5. Swedish Television: “Even if the movie is interesting and plays with ideas, some things are unclear […] Why is a church more safe than your own basement? […] The villain is less important here but there is confusion as to who is attacking.” Their rating is 3 of 5. Dagens Nyheter: “The lack of a clear focus makes the machinery a little slow, it takes too long before the bangs come. There are several interesting themes on threats against Sweden, but too many loose ends.” Rated 3 of 5. King Magazine: “It’s a playful fantasy about what could happen if disaster struck. It is beautiful, atmospheric, dramatic and different.” Rated 3.5 of 5. Kulturbloggen: “Too many details are not right for me to take this movie in.” Rated 1 of 5. Film Fenix: “[This film] is absolutely the best movie that has even been made in Sweden. 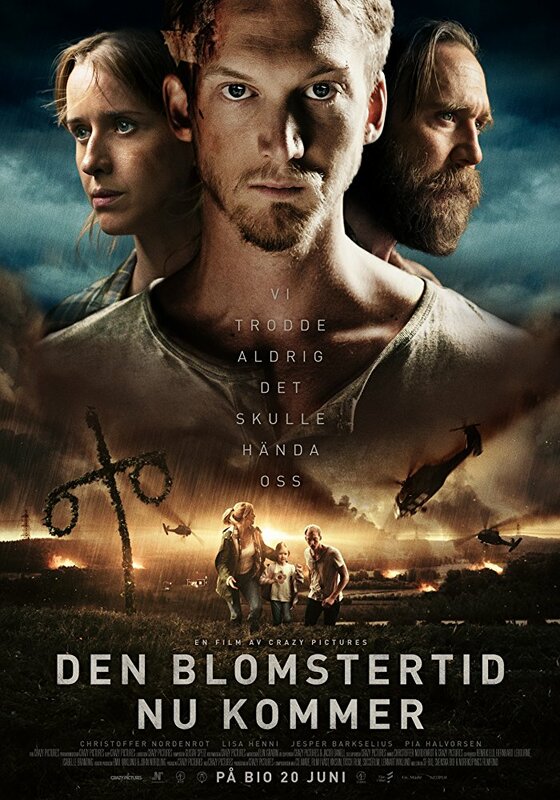 They took a story that does not belong in the Swedish film tradition and with their talents they set the bar very high for the next big movie in this country.” Rated 5 of 5. From 14 reviews in blogs and newspapers, The unthinkable enjoys an average rating of 3.3 of 5, with many critics pointing at details and also the fact that the attacker is never really fully explained. Is it Russia? Is it aliens? Watch the film and try to find out! The film has been sold for distribution to German-speaking territories, Japan, China, Vietnam, Thailand, Indonesia, Malaysia, Brunei, South Korea and Spain. Other countries to follow. The soundtrack to the film has been released on Spotify. The unthinkable stars Christoffer Nordenrot, Lisa Henni, Jesper Barkselius, Pia Halvorsen, Magnus Sundberg, Krister Kern, Karin Bertling and Ulrika Bäckström, and opens theatrically in Sweden on June 20th, 2018.